Professional advice and resources for nuisance groundhog problems. Groundhogs, also known as woodchucks, are large, ground-dwelling rodents. Adults average about ten pounds. They are strictly vegetarians, as many people know, based on the damage in their garden. Groundhogs dig large, complex, interconnecting burrows. They are excellent & prolific diggers. Each spring, a female gives birth to 4-6 young. Groundhogs are true hibernators in the northern parts of their range. The spring emergence always occurs exactly on February 2nd. Oftentimes the groundhog will engage in a behavior known as shadow spotting. Well, perhaps that's not true, but they do emerge in he springtime and resume their digging patterns. Nuisance concerns: The primary problem encountered with groundhogs involves their propensity to dig. They can and do move a lot of dirt, and when this digging occurs near a human structure, such as under a concrete deck, the absence of supporting dirt can lead to a vulnerable foundation prone to cracking. The secondary concern is the groundhog's appetite, and the damage it can cause to crops. Many people wish to remove this animal before their garden is destroyed. Like all rodents, the groundhog's teeth grown continually, and thus this mammal must gnaw, but this isn't usually a problem for property owners. 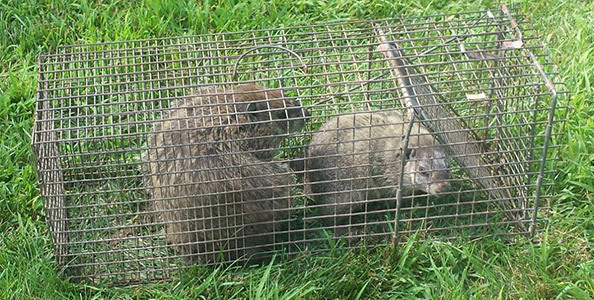 The best way to handle a woodchuck problem is via trapping and removal. If you try to simply fill in their burrows, they will dig their way out. If you attempt to use a repellent, the animals will either ignore it or simply dig elsewhere. There's really no solution outside of trapping and removal. If the groundhogs are under your house or shed, inspect the structure to identify the entry points - you'll need to seal these areas shut after the animals are gone. If the groundhogs are living under a shed, deck, or porch, you'll need to install a steel exclusion barrier around the perimeter to keep them out. Be sure to bury it at least a foot under ground, with the bottom of the steel fence curving outward, away from the structure. If you've installed a barrier, leave one section open to set a trap or a one-way exclusion door to get the woodchuck out. When trapping, use a large sturdy steel cage trap, at least 12"x12"x32". Always set the trap in the shade, to prevent overheating. Make sure the trap is on a solid, level surface. Set a trap at a burrow site, and bait with fresh vegetables like broccoli or peas or corn on the cob. Don't use the old apple and peanut butter method! The best time to trap is in early spring, when the animal is hungry, and there is less food, and before it has babies, which will increase the number of animals on your property. If a possum is eating your garden or other plants you will need to fence these things in. You can buy good fencing materials at Home Depot or any other hardware store. Be sure to bury the perimeter of the fence or stake it down. It may not be legal for you to trap and relocate possums in your state, but if it is, and if you can do it yourself release them at five miles away from your property to keep them from returning. Repellent products, such as mothball or urine granules or powders, have no demonstrated effectiveness in keeping groundhogs away. However, an aggressive dog might work. You can fill in any open burrows, but if there is an animal present, it will re-open them again. Better to fill them after the animal(s) are gone. Wondering how to get rid of groundhogs? There is no magic spray or device that you can use to make them go away. Some people try to sell predator urine, such as coyote or fox urine to get rid of woodchucks, but that doesn't work. They also try to sell ultrasonic sound emitters. These devices are worthless at eliminating groundhogs. Some old wives' tales recommend the use of mothballs or ammonia-soaked rags to make them leave, but I've been to countless homes where these techniques failed - biologists know that these attempts won't work. The ONE AND ONLY WAY to take care of your problem is with trapping and removal of the animals. You can try sprinking epsom salts or putrid egg whites or super spciy sauce on plants you don't want them to chew, but that doesn't always work, and they usually find plenty of alternatives. If you need to find a professional trapper in your hometown, just click our comprehensive list of hundreds of wildlife removal professionals, and you can have your problem quickly taken care of! Groundhogs in a garden area trouble, not only because they eat the vegetables you�ve spent all season growing, but because they usually have a burrow system nearby. If you�ve got a groundhog destroying your plants, your only real option is to have the animal trapped and removed. Groundhogs can�t be poisoned, and there are no reliable deterrents on the market. To get rid of a groundhog in the garden, you need to decide if you want to trap the animal alive or dead. A live groundhog can be relocated a few miles away without worry of it returning. The downside is that you run the risk of potential injury to yourself or the animal. Groundhogs are one of the top known carriers of rabies in certain areas of the country and should be handled with caution. Lethal trapping is accomplished with body gripping traps, and can be just as humane a method as live trapping. No matter what trap you use, place it near the groundhog�s burrow or in the garden. Bait the trap and wait. Eventually the groundhog will be drawn to the food inside the trap, securing its capture. Sheds are perfect places for groundhogs to begin a burrow. Not only do shed floors provide a perfect roof too keep a den dry and unseen, predators will be unlikely to reach a burrow underneath a building. Groundhogs, like most wild animals, will only live near humans if there is some advantage to be gained. Usually the lure if food, but shelter can be just as important. 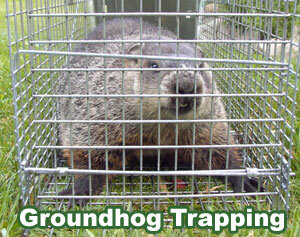 To get rid of a groundhog under the shed, purchase a live, cage trap or a lethal body gripping trap. Because it may not be feasible to place the trap directly next to the burrow entrance, use planks of wood to help direct the animal down a singular route with the trap set in the path of travel. The trap can be baited with fresh vegetables like broccoli, lettuce or corn. If you chose to use a live trap, you can relocate the captured animal a few miles away. With live trapping, make sure you release the groundhog in an area with ample cover. Without the protection of a burrow, groundhogs can be prey for larger predators like coyotes. In some circumstances, lethal trapping and removal can be just as humane as live trapping. Read more about how to remove a Groundhog under My Shed, Deck, or House. It�s bad enough when a groundhog decides to live under your shed or outbuilding, but a groundhog under the house can be compromise the structural integrity of the building. The groundhog under a home probably started as a groundhog under the patio or raise porch. When the animal discovered the foundation to the home, it naturally used the building to help with his burrow infrastructure. The good thing about a groundhog under the house is that he needs to come out sometime for food. By creating a path of travel for the large rodent, you can direct him into a trap without him even knowing. Trapping can be done with a lethal trap, which delivers a humane killing blow with a quick, enormous amount of pressure to the spine and internal organs, or with a live trap which will require relocation after capture. Both methods are acceptable. 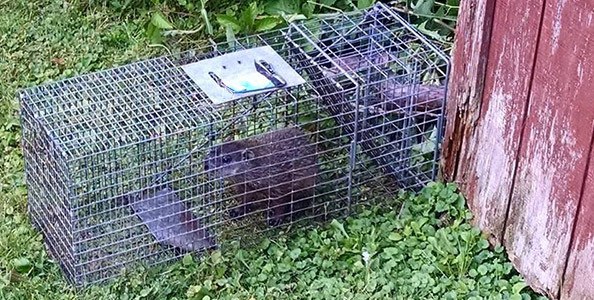 Some people prefer live traps because the thought of killing a groundhog is unappealing, but the relocated rodent may succumb to other deadly factors due to its lack of protection. When choosing what kind of trap to use, select the one that makes the most sense for your circumstances. Relocation is not always an option in certain areas of the country. There�s nothing worse than the large mound of dirt in the middle of your yard heralding the arrival of a large rodent known as a groundhog. Groundhogs are deceptively pleasant-looking creatures with chubby bodies and squatty legs. When cornered, however, they are aggressive defenders of their territory, another reason why you�re loathe to see one in your yard. To get rid of a groundhog, you�ll need to buy at least once trap. Multiple traps are recommended if there are multiple burrow exits. Cage traps and lethal traps are both effective, and the type of trap you select will depend on your location and comfort level. These rodents can be easily relocated without any concern of them returning, but transport and release may not be practical in all areas of the country. Lethal traps will kill a groundhog humanely, but the body will need to be removed from the trap and then disposed of. Groundhogs are known carriers of rabies. Any handling of the animal should be done with the utmost care. Live or lethal, traps should be set as close to burrow entrances as possible and baited with fresh vegetables. If possible, you can use boards or temporary fencing to guide the animal into the trap. Do Mothballs Or Ammonia Help Repel Groundhogs? Will Repellents Get A Groundhog Out Of The Shed Or Porch? Will A High Pitch Sound Deterrent Machine Work Against Groundhogs? How Do You Know If You Have A Groundhog Under Your Shed Or Porch?